IRJIMS – IRJIMS has visualization to publish research articles in the field of Ayurved, Siddha, Yoga, Naturopathy, Unani , Homeopathy, Allopathy, Pharmaceutical science & Allied Health Sciences. 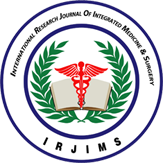 International Research Journal of Integrated Medicine & Surgery (IRJIMS) is a multidisciplinary international peer reviewed quarterly open access online publication of Pranjali Publication House. The aim of the journal is to provide platform for researchers to disseminate empirical research findings which are going on all around the world. IRJIMS has visualization to publish research articles in the field of Ayurved, Siddha, Yoga, Naturopathy, Unani, Homeopathy, Allopathy, Pharmaceutical science & Allied Health Sciences. IRJIMS has visualization to publish research articles in the field of Ayurved, Siddha, Yoga, Naturopathy, Unani , Homeopathy, Allopathy, Pharmaceutical science & Allied Health Sciences. The journal invites.